San Francisco offers myriad possibilities to explore, and you can customize your itinerary on this private half-day tour. Let a personal guide lead you through city highlights such as Ghirardelli Square, Lands End, Golden Gate Park, or Union Square. Round-trip hotel or airport transport is provided by private vehicle. 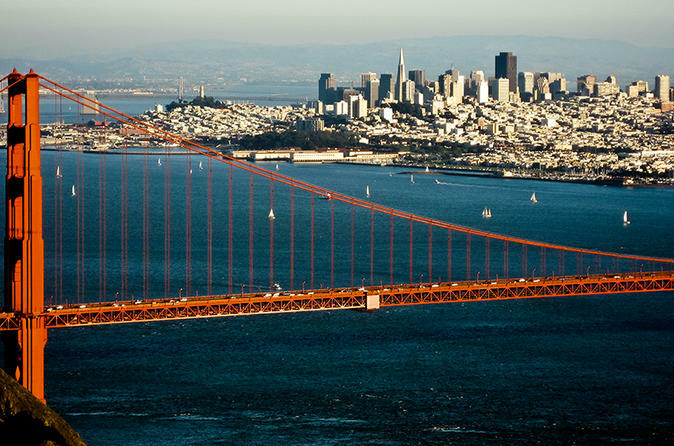 On this private, customizable 4-hour tour, you will be picked up from your hotel or the airport and driven to major locales in the metropolitan city of San Francisco. After booking, let your guide know of any particular interests or preferences, or feel free to make suggestions during your route. Don't miss a drive across the Golden Gate Bridge to the waterfront town of Sausalito or Tiburon's Arc Row. Or, view the postcard-perfect landmark on an easy hike from Lands End near Ocean Beach, the Cliff House, and Golden Gate Park. Perhaps explore the shops of Union Square, the Embarcadero, or the Metreon; see the exhibits at the San Francisco Museum of Modern Art (SFMOMA); take in the vistas from Nob Hill, Telegraph Hill, and Russian Hill; visit Coit Tower or pass by the mansions of the Marina District, Sea Cliff, and Pacific Heights; wind down the hairpin turns of Lombard Street; visit the popular attractions at Ghirardelli Square, Fisherman’s Wharf, Pier 39; discover the cuisine of Chinatown and North Beach; or explore neighborhoods such as Japantown, the Castro, Noe Valley, the Mission, the Presidio, Haight-Ashbury, or the Fillmore district. Afterward, you're returned to your starting point by private vehicle.